Manchester United shareholders have been told they have until Monday, 13 June, to sell their shares to majority owner Malcolm Glazer. Red Football, acting on behalf of Mr Glazer, currently owns about 76.2% of Manchester United shares. Mr Glazer's next step will be to delist the club from the London stock market, probably on 22 June "or as soon thereafter as is practicable". The takeover by the US billionaire has been fiercely resisted by fans. In total, members of fan group Shareholders United say they own about 15% of the club. Mr Glazer hopes to secure 90% of the shares he does not yet own, so that the remaining shareholders can be legally compelled to sell. Shareholders have until 1500 (1400 GMT) on 13 June to take up the 300 pence-per-share offer. 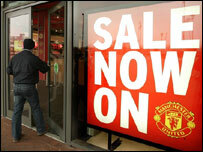 After that date, Mr Glazer says, he may not buy their shares any more. The end of Manchester United's 14 years as a publicly listed company is bound to come to an end regardless of whether the remaining shareholders sell up. Mr Glazer had the right to turn the club into a privately-held company ever since he acquired more than 75% of its shares. The very latest date that Mr Glazer will take the firm private is Thursday, 30 June. In the offer document, the Glazer family reiterate that they "are keen supporters of Manchester United and long-term owners of Manchester United Shares". "Red wants to work with current management, players and supporters to ensure that the significant successes enjoyed by Manchester United, both on and off the pitch, continue," the document asserts. The Glazers promise to give Manchester United "executive directors and senior employees" all their share options in Manchester United straight away. More than one-third of Mr Glazer's £790m offer for the club is debt secured against United's assets, such as its Old Trafford stadium, while a further £275m comes from loans from three US hedge funds. Besides his property interests, fish oil business and car safety equipment company, the 76-year-old Mr Glazer also owns an American Football club, the Tampa Bay Buccaneers, whose financial and sporting fortunes he turned around, albeit at the cost of higher ticket prices.